Halloween is this weekend! What kind of Fright Night fun do you have planned? 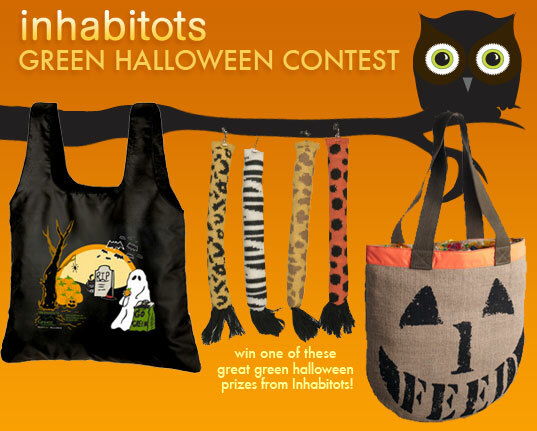 We hope your spooky celebration will include taking photos of your kid all decked out in his homemade or eco-friendly costume and then uploading them to our hauntingly easy-to-enter Inhabitots Green Halloween® Costume Contest site. If our judges deem your scary sweetie’s costume one of the six best, you could win a spooktacular prize such as an Oeuf Mask & Tail set, Yummy Earth lollipops, FEED Trick-or-Treat Bags to Benefit UNICEF, eco-friendly Halloween bags from ChicoBag, or Inhabischwag. Halloween is this weekend! What kind of Fright Night fun do you have planned? We hope your spooky celebration will include taking photos of your kid all decked out in his homemade or eco-friendly costume and then uploading them to our hauntingly easy-to-enter Inhabitots Green Halloween� Costume Contest site. If our judges deem your scary sweetie's costume one of the six best, you could win a spooktacular prize such as an Oeuf Mask & Tail set, Yummy Earth lollipops, FEED Trick-or-Treat Bags to Benefit UNICEF, eco-friendly Halloween bags from ChicoBag, or Inhabischwag.